Epipen is a registered trademark of Meda Pharmaceuticals Ltd. For the purpose of this article the term Epipen is used as shorthand for any pre-filled adrenaline auto injector. The use of this term does not signify any preference of Epipen over any other brand. Can a first aider can administer adrenaline to a casualty who is experiencing an anaphylactic reaction? Essentially, yes. But it is important to know why because the laws that exist to allow people to administer adrenaline via an Adrenaline Auto Injector (AAI) are specific to adrenaline and do not translate to other drugs or other medical problems. Regulation 214(2) of the Human Medicines Regulations 2012 specifies that, for Prescription Only Medicines (POMs) no person shall administer (otherwise to himself) any such medicinal product unless he is an appropriate practitioner, or a person acting in accordance with the directions of an appropriate practitioner. (An appropriate practitioner is a doctor, a dentist, a supplementary prescriber and, within the terms of the legislation covering their prescribing, independent nurse practitioners). In the case of Adrenalin by 'auto-injection', Regulation 238 of the 2012 Regulations provides an exemption to where "Regulation 214(2) does not apply to the administration of a prescription only medicine specified in Schedule 19 where this is for the purpose of saving life in an emergency." Schedule 19 includes Adrenaline 1:1000 up to 1mg for intramuscular use in anaphylaxis, the concentration found in auto-injectors. Because of the seriousness of the situation, a casualty who has become exposed to an allergen and is displaying signs of reaction a lay-person can and should administer a casualty's adrenaline if the casualty has it with them. This situation is accepted and reinforced by the Health & Safety Executive in their statement here. "There is no legal problem in any person administering adrenaline that is either prescribed for a specific person or administering adrenaline to an unknown person in such a life saving situation (through specific exemptions in the medicines act). However the first aider involved must be competent in being able to recognise the anaphylactic reaction and administer adrenaline using an auto-injector. First aiders must ensure that they work within the guidelines of the first aid training organisation that issued their qualification and their employer." To conclude, if you are suitably trained in the recognition of an anaphylactic reaction and the administration of an adrenaline auto-injector, it is not just permissible but recommended that the casualty is administered with that adrenaline, with or without a prescription. Does the same apply to Asthma Inhalers or GTN spray? No. Whilst these, and other drugs, are also included in Schedule 19, the permission of a lay person to administer Adrenaline to a casualty in the interest of saving life is only extended to Adrenaline. 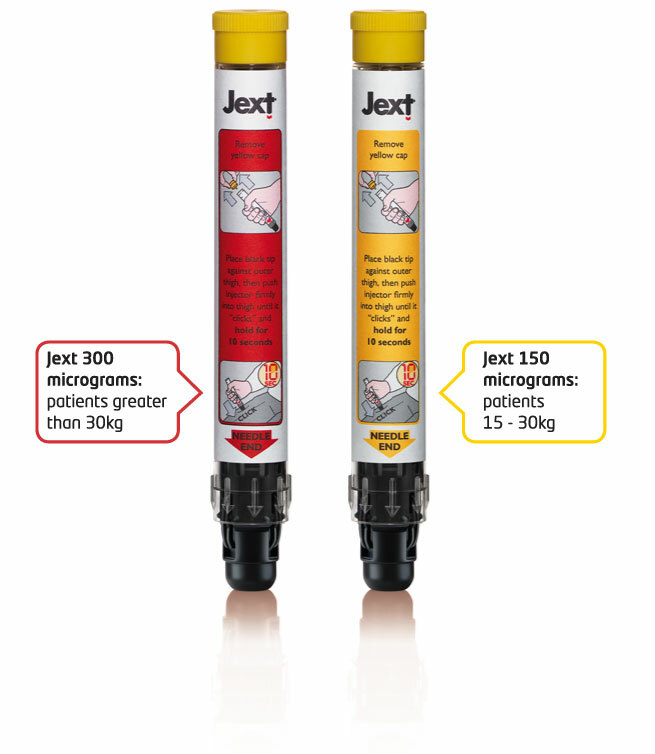 Adrenaline Auto Injectors are designed to deliver and intra-muscular injection, allowing absorption up to 4 times quicker than subcutaneous route (1, 2) The nominal length of the exposed needle of Epipen and Jext auto-injectors are 15.02mm and 15.36mm (3) respectively which has been found to be not long enough to penetrate the cutaneous layer and muscle fascia when administered in the thigh, in the majority of adult cases. The Medicines & Healthcare Products Regulatory Agency (3) and the UK Resuscitation Council (4) recommend an needle length of 25mm in all adult cases. The Emerade auto-injector has a nominal needle length of 25mm (for adult 0.5mg and 0.3mg doses) and 16mm (for infant 0.15mg doses) meaning the Emerade auto-injector more effective in the emergency administration of adrenalin for the anaphylactic casualty. Should I carry an AAI just in case? No. Regulation 238 gives permission for a lay-person to administer Adrenaline for the purpose of saving life if it is available. To carry Adrenaline around with you, with the intention of treating a casualty you may encounter is, effectively, prescribing the drug, which is illegal. Regulation 214(1) (not to be confused with Regulation 214(2) cited above) states "A person may not sell or supply a prescription only medicine except in accordance with a prescription given by an appropriate practitioner." To carry an AAI (or other POM such as an Asthma inhaler or GTN) is intention to supply without the correct prescription for that medication. (b) P intends to supply it otherwise than in accordance with a prescription of an appropriate practitioner. The use of AAI is covered on all of our first aid courses. The Practice Nurse at your GP’s surgery will also be able to train you in the use of these pens. As with all common medical conditions (such as asthma, epilepsy and diabetes etc.) the experts are those who live with the conditions; get to know the people you work with and ask them what they would do and how they manage their condition. Work with them to develop a simple procedure should an emergency occur. 1. Simons, F.E.R., Roberts, J.R., Gu, X., and Simons, K.J., Epinephrine absorption in children with a history of anaphylaxis. J Allergy Clin Immunol, 1998. 101: p. 33-7. 2. Simons, F.E.R., Gu, X., and Simons, K.J., Epinephrine absorption in adults: Intramuscular versus subcutaneous injection. J Allergy Clin Immunol, 2001. 108: p. 871-3.